Earlier this week in Juba, the United Nations Mission in South Sudan (UNMISS) destroyed twenty five firearms and hundreds of knives, machetes and similar weapons confiscated from Internally Displaced Persons (IDPs) living in its Protection of Civilians (PoC) sites. In the presence of foreign diplomats and members of the media, staff members of the UN Mine Action Service (UNMAS) fed pistols, AK-47 assault rifles, iron bars and other arms into a weapons shearing machine that sliced the items into small, unusable pieces. Over 1,500 rounds of ammunition recovered from IDPs will shortly be detonated near the community of Nyolo, south of the nation’s capital. Similar weapons and ammunition destruction events will be held later this month at UNMISS bases in Malakal, Nassir, Wau, Bentiu and Bor. Loej noted that since the crisis in South Sudan began nearly a year ago, all civilians and ex combatants seeking shelter at the Mission’s compounds have undergone thorough security checks and surrendered all weapons in their possession before being admitted into UNMISS protection sites. All weapons have been carefully inventoried and securely stored from the time they came into the possession of the Mission. 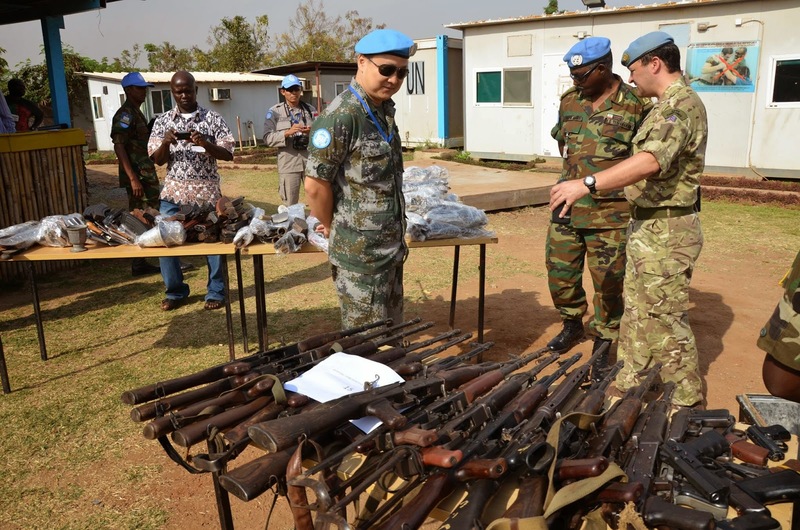 Periodic searches of the protection sites conducted by UNMISS police and military personnel have also been carried out in order to protect the civilian character of the sites. “These arms and ammunition have been recovered from civilians and ex-combatants regardless of their political loyalties or ethnic backgrounds,” said the SRSG. “We hope that the destruction of all confiscated and ammunition in the Mission’s custody will help foster an environment that is conducive to the silencing of the guns and the restoration of peace to the world’s youngest nation state,” concluded SRSG Loej.